One of the many fabulous dishes America welcomed with me when I first arrived here nearly 13 years ago, is a bubbly & cheesy mac straight out of a hot oven. Sure, there are oven-baked cheesy noodle dishes in Belgium too, but they’re falling dramatically short from the cheesy, creamy deliciousness I’ve enjoyed on this side of the Atlantic. 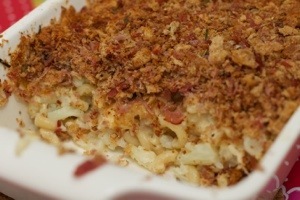 For starters, Belgian macaroni and cheese dishes lack flair and creativity, in my opinion. Almost as if nobody cared to explore the culinary possibilities of this American staple. Overall, I think American cuisine gets a bad wrap in Europe due to all the sub-par hamburger chains and cheap fast food joints that are being lobbied as a slice of ‘real’ American life. It’s entirely false, and I’ll come right out saying that I’ve enjoyed some amazing cooking & food here. So to whomever put mac ‘n cheese on the culinary map, I thank thee! (Oh, and a special thank you shout-out to Vermont extra-sharp white cheddar, Maine lobster, Alaskan king salmon, Georgia peach cobbler, Boston cream pie, Mississippi mud pie, California avocados, Texas BBQ, Missouri’s St. Louis style ribs, Hawaii’s macadamia nut crusted mahi mahi & pupus, New York cheesecake… Yeah, I rest my case). Over the years, I’ve played around with many mac ‘n cheese recipes I found online, but I finally settled on my own creation below, which is more of a grown-up mac and has bit more depth of flavor. I hope you enjoy it as much as my family & I do. (*) I shamelessly stole this idea from the Hard Rock Cafe in Hollywood! It gives the sauce a bit of a kick in the pants. Make a simple bechamel sauce, by melting the butter in a pan and adding the flour. Cook for a minute until flour & butter are one, then add milk and stir until all lumps are gone. Bring to a simmer and stir until the sauce thickens. When thick, remove from heat and incorporate all cheeses into hot sauce. Add buffalo wing sauce and season with salt & pepper to your liking. Add a pinch of nutmeg. – 2 boxes of elbow macaroni or cavatapi, or another kind of small pasta noodle. Heat oven to 400F. Lay bacon slices out on a foil-lined baking sheet, bake in the hot oven for 15-20 minutes until browned and crisp. Set aside and let cool slightly until your are able to crumble the bacon by hand. Turn oven down to 350F. In the meantime, bring large pot of water to a boil and cook pasta according to box instructions until “al dente”. Drain cooked pasta and place in a large oven dish. Pour cheese sauce over it and crumble bacon all over the top. Fold sauce and bacon into the pasta, then sprinkle the top with the breadcrumbs or corn flakes and drizzle melted butter evenly over the top. Sprinkle top with chopped rosemary. Bake for 45min or so until it’s bubbly and the top layer has crisped.